How to keep roaches away from bed? This is a question a lot of homeowners all over the world constantly ask themselves. Cockroaches are disgusting bugs that nobody wants to have running freely anywhere in their home, especially in bed. Fortunately, there are many measures you can take to keep them away from it and even from all the space you inhabit. This article will break down the many ways you can stop the invasion of cockroaches into your bed. Take your pen and paper and learn how to keep roaches away from your bed. Look for points by which they could enter your room. Firstly, take a few minutes to look for places where cockroaches could enter from outside in your entire room. Look closely at the areas in which the walls meet the floor and ceiling, the corners, the ventilation slits and the surroundings of the windows. Note that cockroaches can slide between holes and cracks that are 3 mm high. Seal the cracks with the caulking gun. Buy a caulking gun at a home improvement store. It will come with instructions, so read them carefully before trying to use it. If you find a slot that you think could get cockroaches into your room, place the gun nozzle over the slot and move it along it while pressing the trigger to fill it with putty. Allow the putty to dry for the time recommended in the product. Check the ventilation grille panels and change them if necessary. The only thing that prevents entry to your room from these grilles are the panels. Meanwhile, if you think they have a hole, change them as soon as possible. If you find a very small hole or you want a temporary solution, you can cover it with one or two layers of resistant tape, like the insulating tape. Install weather stripping on the doors. Although the door of your room probably opens to the rest of the interior of the house, the cockroaches that enter through other doors can reach you or your bed. Install weatherstripping on all doors that go outside so that cockroaches do not get into your house because of the spaces between the door and the frame. Get rid of the bedding that crawls on the floor. If cockroaches easily get to your house or your room, it is possible to prevent them from getting into your bed. Tuck your sheets and change the very large quilts for smaller ones that do not reach the floor of the room. This will make it harder for cockroaches to climb onto your bed. It is possible that these insects climb the skirt of the bed. If you have one, take it out. Wrap the bottom of the bedposts with silicone tape. Buy a low adhesion rubber silicone tape at a hardware store or on the Internet. Wrap each bedpost with the tape from the bottom of the mattress to the floor. This measure will also ensure the cockroaches do not climb to your bed if they come to your house. Discard and store what is piled up. Obviously, cockroaches are attracted by disorders, because it gives them a place to hide, and live without being exposed and without being disturbed. First and foremost, divide the clutter of your room into piles to “throwaway” and “save.” Then, discard the items in the stack to “throwaway” and save those in the stack to “save”. Cockroaches are particularly attracted to cardboard and newspapers. So get rid of the newspapers or change the cardboard boxes for plastic storage containers. Try to have the dirty clothes in a laundry basket and the clean clothes folded in your dresser or hanging in your closet. Have your room and your house clean. 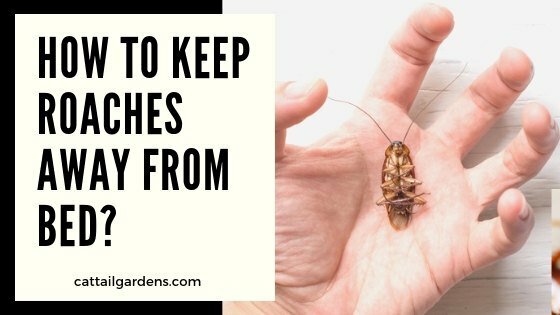 As earlier mentioned, cockroaches develop in dirty environments, so it is very important that you clean your room regularly and also the rest of your home. Sweep, dust, mop, vacuum, and rub surfaces with a multi-purpose cleaner once a week or so. Also, it is crucial that you always wash the dishes and take out the trash. Cockroaches love food, so a kitchen sink and a full trash can will attract them to your home. If possible, do not put any food in your room. If you have to store any food inside, keep it in well-sealed boxes or bags. Clean the waste from your garden. If you extend the hostile environment to the outside of your home, the cockroaches are much less likely to enter your home, your room and, ultimately, your bed. These bugs like to spend time under ruined wooden rumpuses and dead leaves. Rake the dead leaves and discard them, and organize and clean the piles of wood you had in the garden, especially if they are near your home. Spray cypress & peppermint oils under and around the bed. These essential oils tend to repel cockroaches naturally. Combine 8 drops of cypress oil, 10 drops of peppermint oil and 240 ml (1 cup) of water in a spray bottle, and then spray the mixture where you see the cockroaches. When you’re not sure, spray under and around the bed. Drive cockroaches with ground coffee. Because coffee can hurt these insects, they tend to get away from it. Sprinkle some ground coffee in different open containers and put them under or near your bed to chase away the cockroaches. Ground coffee can be a good repellent for other insects too, such as ants, due to the caffeine it contains. Use pieces of the cigar to repel cockroaches. The nicotine found in the cigar acts as a roach repellent. Therefore, if you or someone you know smokes cigarettes, pick up pieces, sprinkle them in a few containers without covering them and put them on the floor near your bed to keep the cockroaches away. Crush bay leaves and spreads them as an alternative. The bay leaves also act as a natural repellent of cockroaches because they hate their smell. Use mortar or another crusher tool to turn a few bay leaves into powder. Then, sprinkle it on a few containers without a lid and put them all over your room and your bed. Make a homemade insecticide with baking soda and sugar. 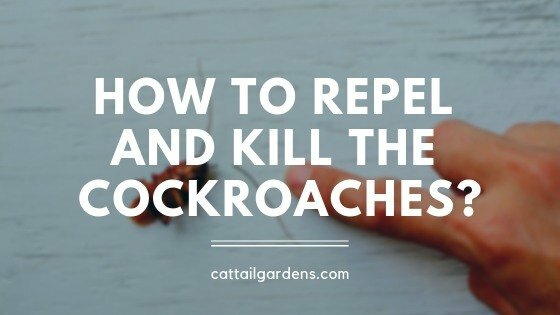 Although killing cockroaches will not solve the whole problem, it will decrease your population in and around your home. If you want to kill them, combine equal parts of baking soda and sugar in a bowl. Then, just spray the mixture throughout your room. The sugar will attract the cockroaches and the bicarbonate will kill them when they ingest it. Sweep or vacuum the mixture after a few days and discard any dead cockroaches you will find. This mixture is safe to use with pets and children in the house. Use boric acid in severe cases. This component is one of the most effective products to kill cockroaches, ants, and other pests. Buy a little in your local supermarket or on the Internet if you have a serious problem with this insect in your home. Spray some boric acid on the floor of your room. In this way, when cockroaches walk on it, it will stay in their bodies and then die when they groom themselves and ingest it. Keep boric acids away from children and pets, as it is toxic and can be very harmful if consumed. Do not forget to vacuum or sweep boric acid after 1 to 2 days. Boric acid is not effective when wet or when it is overfilled. Meanwhile, if you have tried to get cockroaches away from your bed, your room and your house, but you do not get it, call an exterminator. We hope this article suffices in your need to keep cockroaches away from your bed. If you find it useful, don’t forget to like, use the comment section and share this article.